Mark Chally, creator of the PodPod acrylic portable device stand (above), is one of the companies and individuals that Apple has contacted regarding marketing products using the term “pod”. 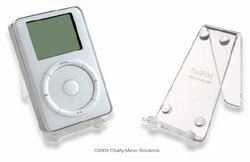 Apple claims there may be “confusion” between the iPod and PodPod marks. I consider this claim absurd. No one would confuse my web site or my hand-crafted product with any endeavor by Apple. Apple has also sold products bearing the syllable “pod” in their names–online and in their retail stores–both well before and well after approaching me in regard to the mark. I doubt they approached any of the manufacturers of these and other products bearing “pod” in their marks, before approaching me. One might suspect that they were unable to obtain the “pod” mark because of the earlier application for the PodPod mark, as some have claimed the trademarks are essentially the same. That’s hilarious, I recently had a problem with a trademark name, but come on, for the portion “pod”, like seriously! is this the same Mark Chally who went to Calabasas High and then Cal Lutheran?